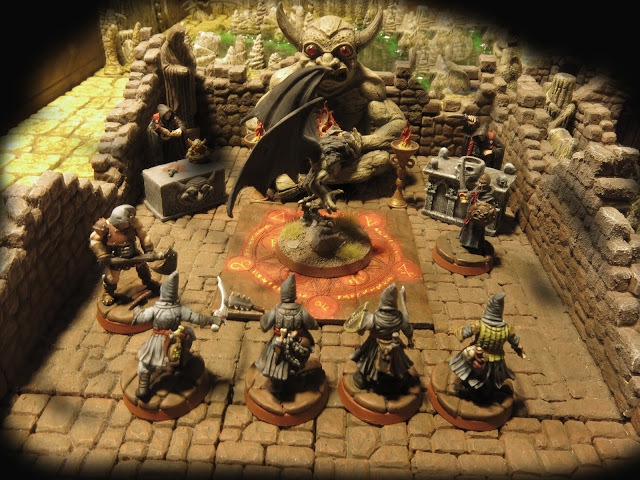 Summers distraction’s certainly got the better of me, but an early harsh fall has us spending weekends inside and me getting back to some fantasy gaming. We actually played this awhile back but the time it take to put these write ups together plus all the other things I want to mention should be an easy 2 or part post, Ill get the game in here and most of post game , advancement details in Part 2. 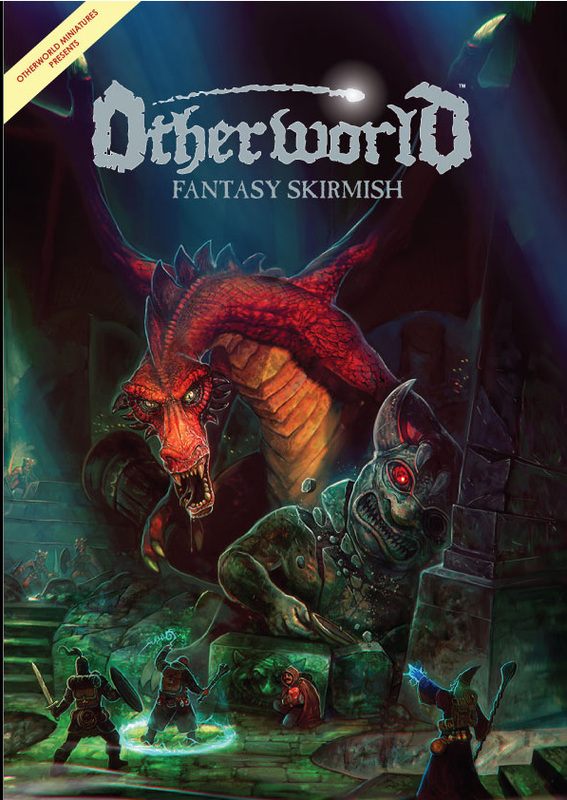 Let start with basics: we revisited the Otherworld Skirmish rules for this and had a grand old time, while our homebrew RPG rules were cool they’re a bit busy and for this bigger skirmish I wanted something totally fleshed out. 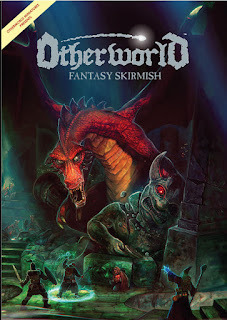 Having played an posted a bunch of Otherworld Skirmish (OWS) games before I was prepared , but the game does has some shortcomings which I needed to resolve for the ongoing narrative of the endless campaign based on our little village. While I have always liked this game , the draw backs for me were always- There are no Campaign rules , There is a serious lack of classic spells, and the game is based on the limitations of one off encounters faction vs faction. Finally I don’t really love the D6 as the sole game die and more fond of other wider result dice..but it is what it is. Applying the needed fixes for Blackbarrow required the following, we record Victory points (VP) to not only decide who wins but as experience for faction members , each faction member gets 1 VP for surviving a match -standard VP rules per the book are applied to scenario so multiple VP can be awarded to various team member based on events , I’ll go over this more in the post game but basically I’m taking a Mordheim-esqe approach to the post game. We'll be converting VP to gold and that be used to buy additional skills which are already specified in each units profile. There is Out of Action (OoA) injury chart for Character knocked OoA but not killed outright and a few other advancement options concerning building up team funds and buying items etc. We left episode 3 in a Cliffhanger where the adventures found themselves surrounded by men pouring out the Dungeon while be confronted the mysterious ethereal evil spirit. We had one character Killed and two that ran off (one being a secret cult member who’s task it was to lure people out to the ruins) after battling various undead being to called to a green flaming beacon placed by persons unknown , the remaining four characters finding themselves prisoners of growing Cult running its operations out of the Dungeon. The Adventures of the Hall of Tyr respond to the call of a rescue party, although they are less concerned with rescuing the men for the Wayside Drinkers Club, and more concerned with busting up the Cult’s activity which they have been monitoring since Episode 1. We are using the OWS rules here only modified in the post -game phase to create a campaign of ongoing battles and provide unit advancement. As you will see below several of characters have advanced since Episode 1, which is track by their gold piece cost on the roster. Last time we saw the Cult’s Leader was in Episode 1 where he never got into the action, since then he’s grown much in power, teamed up with a Demon and gotten a bunch of Followers and Henchmen to join him. Beleg / Wretched Priest /Cult Leader – sold his soul to Orcus many moons ago for power and his hope to rain terror and death down upon Blackbarrows Castellan and any who get in his way. he's almost tripled in cost since Ep1 and has been given a powerful summoning circle that allows him to summon a Demon to serve him. Executioner- The Castellan’s Castle executioner is a cult agent , executions are a rarity in Blackbarrow his other job as stableman is less appealing then playing for the Cult. 4-Worshippers – the Cults muscle / cannon fodder, fanatical , disposable. New Spell, Inflicts Wounds (9+) a unholy blast causes 1 hit, with no save. Any remaining Adventure tokens that are not revealed go to defender should they win, traps are discarded and VP or items are added to factions treasury. There are no wandering monsters in this part of the Dungeon, the rats are just decoration. The Attacking team decides to eliminate guards in eastern hall and a grab an easy Adventure Token. Harald the Priest follows also moving 6 " but for his 2nd action casts Blessing his Intelligence is a 3 but he has 2 magic dice , needing a “8” to cast the spell he rolls an “8” + 3 (his INT) for 11 and Blessing is cast we add second luck Token to the Attackers Pool. The Ranger and Holger the Henchmen both activate and move slightly to get a better view down the long western hallway, but don’t advance without the other hoping to protect the rear. Starting the turn walready man down they start with 4 activation tokens. Worshipper 2- seeing his comrade cut down, now alone facing 3 enemies would need to make “Alone” morale test, however the worshippers are “Fanatics” and ignore this . this fellow moves to nearby secret door and uses his second activation a "special action" to open it. Worshippers 3 and 4 across the western hall to charge thru, it’s an Ambush! Worshipper 3 moves 6 then Charges the Paladin, still in the doorway.. he hits on 5+ but since its charge needs a 6, he rolls a 4 missing. Worshipper 4 moves up to try to join the fight. For the 4th Activation, we activate the Demon who hearing the commotion in the hallway decides to investigate. Moving 6 (flying) he see’s the Ranger and the Veteran Henchman at the end of hall.. So he charges!..attacking with his Rending attacks he normally needs a 3+ but in this case it’s a 4+ and he rolls a “3” being it’s the last activation of the Turn , he use the team one Fate token to make that a HIT! its attacks are strength 5 and Brutal needing only a 2+ for wound…Our Henchman only has one wound both dice come up hits only keeping the highest( 5) Holger is toast but he has Light Armor and a Shield so he has a 5+ Save…we roll a “4” not good enough but we use their FATE token to make that move that 4 to a 5 and the Henchman survives the Charge. Arturus the Paladin. engaged with Worshipper 3 who charged him last turn, upon activation he can give both his Squire and Harald the priest activation tokens thanks to his Leader (2) ability. His first activation is to attack, he hits on a 3 and wounds 4 putting the engaged cultist down as well. For his second activation he immediately retreats 6” as he hears the screams of his comrades fighting the demon. Holger the Henchman is next, upon activation he must make a Fear test as the Demon is fearsome his Morale is 3 so he needs a 4+ and rolls a 4+ and stands true. He attacks and needs a 4+ the Demon is a large creature making it a 3+ he rolls a 3! A hit , while the Demons Defense and the Henchmans Strength are both 4. The Demon is invulnerable (1) which reduces the attack to Strength 3 , meaning he now needs a 5+ to wound he rolls a 4 but we gamble and put our fate point on the line to make that hit count! the Demon howls as it takes a wound…..
Killian the Ranger must also make the Fear test he rolls a “1” failing miserably and now suffers the SCARED status giving him -2 to hits… Killian a crack shot only needed a 2+ to hit due to the demons size that now goes to 4…..I want to move him away we opt for the shot on a 4+ and roll a 6! We need a 6 to wound however due to invulnerable lowering the bows strength…and roll a 2, he just outside of 6” from the Priest so we cannot use a Luck token otherwise I would…the arrow bounces off the Demons thick hide. On his second action he moves 6 inches into the Western Hallway..
Harald is next , using both action to make a double move toward the Demon , he starts out far enough away he doesn’t need to make the fear test, but will next round. Being now 3 men down they start with 3 activation tokens..the Demon gets ones as does Cult Leader Beleg and so does the Executioner. Executioner activates making a double move toward the remaining worshipper thru the open secret door. Ghzul the Demon uses his Claw attack with 4+- having the “unarmed adept” ability he rolls 2 dice keeping the highest in this case hitting with a “5” he only needs a 2+ to wound the Henchmen and rolls a 5+ , Holger does have a 5+ save which he rolls a 4+ we use our fate to make it a 5 and his armor and fate save him again. The Demon has a second activation he follows up with his Brutal Rend attack easily hitting and wounding Holger again, he rolls a “1” and we use our one Luck token to reroll rolling a ‘3” not good enough and the Henchman is smashed against the wall . knocked prone and is Out of Action. Both Acolytes make double moves preparing to engage the Temple invaders. Oh how the wheel turns,couldn’t be a worse time for brothers of the Hall of Tyr to lose Initiative! The Demon Licking his lips charges Harald the Clumsy Priest, but the Demon see his Holy Symbol of Tyr and pauses he must make an opposed morale test against Harald but laughs it off with a score of 10 to 5 in his favor. The Charge continues…using he Claw Attack he rolls a 3 and 1..missing…he then turns to Rend in his second activation hitting with a 4 on the 3+ he gets 2 two dice needing a 3, but rolls a 2 and 1..we can use fate but Harald has Heavy Armor (a 5+) plus save and the Attacker have a Fate point… so it potentially 50/50 we waste the fate point and there are 4 more figures to go… so the Demon grimace hissing “you got luckly priest.”. So he needs a 3+, we roll a “6” so the spell is cast and Harald takes an single wound..ouch! Acolyte 2 , follows suit trying to cast cause wounds, he moves first to get into range so he cannot chant but rolls a 1 on the casting attempt…the spell fizzles. Harald, wounded uses his first must make a Fear test which with he passes with a 3 from his 4 morale stat..next he uses his potion of cure wounds to Heal Himself and passes the intelligence test with a 5 then attacks the Demon with his mace missing with 2! Killian is next he’s got the lone worshipper down the hall and the Demon in his bow sights , he suffering the sacred status so he’s -2 two to hit but he can Aim and take no penalty from long range thanks to “eagle eyes” both shots with various modifiers work out to be “4+” but the shooting the Demon is too hard to wound and I could potentially ended hitting poor Harald. He takes the Aim shot down the Hall rolls a “4” then another “4” to wound..all the Cultist lackeys are now Out of Action. End Phase – Only Killian is current suffering a status he rolls two dice and does not get a “6” he remains scared of the Demon. Attacking large target and flanked he hits on a 2+ and wounds on a 5+ against invulnerable (1) but he gets two dice to try to get the wound he rolls 2 to hit 4 to wound, we use our one fate point to put the second wound on the Demon…next attack is another 2 and ……drum roll please we get a “5” the Demon howls…at Arturus invokes Tyr’s name on the blow, the demon falls. This is a very bad for the Cult as they are now at ½ strength and will need to make shaken tests..
Harald is next and immediately attempts to cast blessing twice to put some luck on table… rolling natural 9 and 11 , Tyr’s holy light is with them and the attackers get 2 Luck tokens..
Killian , while still scared can now move toward the Demon since its fallen but decides to double move toward the open secret door near Crtisoffe and catch the remaining Cult members in a crossfire . Acolyte 1 st activation Chant..second inflict wounds rolls a 6 (+4) for 10! Harald goes OoA ouch this is bad! The goes the Luck pool ( as far as I can tell, if the units with the Luck ability go OoA you lose access to the luck pool they need to be within 6” of the unit with Luck to use it . Having multiple figures with the luck ability is clearly a good idea. Casting frenzy put both Harald and Killian OoA, you need to charge them you dummies! Cast inflict wounds but without chanting rolls a “2” +4 =6 fails.. Turn 5 before both Acolyte 2 took an arrow to the face and The Ranger is brought down by multiple inflict wound spells. I screwed up here moving Killian away with Harald OoA, I cant activate all three of my units as the Ranger and Squire are too far away for leadership. He has the Onslaught ability so he can reroll a missed attack, He doesn’t need it hitting with a 4 and the brutal ability lets him roll twice looking for a 5+ he gets a “6” and Arturus would take his first wound but he makes his 4+ armor save with a 4…. The decisive battle, Arturus was nigh unstoppable in melee, the executioner should have focused on the weaker characters and tried to force a rout...let the spells take this guy down....they learned their lesson for next time. Acolyte has to tougher job with one dice but he can chant for + 2 but rolls a 1! !…so not good enough. The fate wont help us here and Killian skates by. End Phase- No more morale testsyet, Killian tries to remove his Scared Status rolls a 2 and 5 but we use our remaining Fate to make that 6 and he is finally no longer scared! 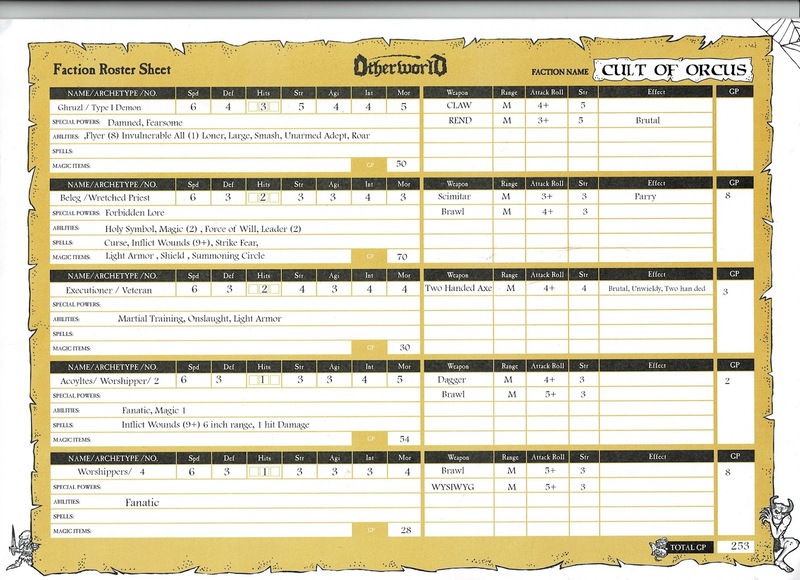 Nerfing the Leader ability doesn’t do much here but the Morale hit does if he can take out Killian and force the shaken test..
2nd action inflict wounds on Killian… 9 +4 =13 on the 9 casting requirement ….Ouch Killians fall OoA..
Executioner -1st action attack! Rolls a 4! Hit to wound a 3..miss…. 2nd action attack again 4 again then a 4 to wound , the Cult uses its fate token to make it a 5 and a hit..
Arturus then rolls a 3 on his save and takes his 1st wound..
Arturus must respond to the Executioner pounding on him attacks hits on 3+ wounds on 3+ (executioner is Def 3) I roll 5, then 4, 3 (wound) and 4, then 2,6 wound, Executioner Drops OoA. Shaken Test for Hall of Tyr at -2 ( extra penalty for Strike fear) need a 5+ roll a 5! I roll a 3.the Cult is Defeated. The Attackers win this battle on Victory Points 7 to 5 not rout by any means yes, Beleg’s and Cult suffered a loss via wipe out. He just escaped in the Dungeon to fight another day. Wounded himself, a down to just his Squire, with 3 unconscious / or worse (we will see in moment) Arturus must abandon any hope of finding the lost Waysiders from Episode 3 and return to the Village. Arturus " you know I'm not using that shield right??" Cristoffe " maybe I can paint it??" Great writeup, sounds like a very closely fought battle. Highly appropriate for the 'PCs' to retreat at the end of the battle, hard to know what else is down there. Happy day! It has been way too long since your last post. Was hoping to see a return of "Otherworld," too. I have yet to try it, but your posts on the game always make me tempted. And love the evocative photos, as usual. Hope it's not another few months before you post about one of your games!